Regardless whether it is formal or informal occasions, suits are the preferred attire for every modern man, who has a reed-slim silhouette. But blokes carrying few extra pounds always find a way to stay away from this modern ensemble with the fear of getting their bloated bellies exposed. All body shapes are beautiful and there is a suit to flatter every body shape. If you are stout, obviously you look frumpy on slim cut suit as your bellies pull right and left, when you walk and your shirt billow outward, when you sit or stand. Problem here is not with suit, it is with the selection of suit. Understanding your body type and then selecting a suit is always a great option. If you're a stocky person and your chest and waist measures same length, nothing fits you better than a portly suit that is made to mask the unattractive expanses of your body, rendering a fabulous pull together look. 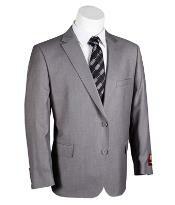 Portly cut is invented with the intention of making the suits fit better for a full figured man. It is more or less similar to standard cut, but the major difference between them is that its drop. For normal cut the drop measures 6" whereas portly cut features 4" drop. When the size of garment featuring this type of cut gets larger, the drop gets smaller accordingly. Height of the outfit is paramount in pulling a proportioned frame to your masculine physique. Portly suit's height falls into three categories short, regular and long. Taller persons with wide chest look handsome in long suits whereas small chest guy measuring a normal height can opt for regular size. Heavy man looks odd on tight fit dress shirts as their wide chest bulges outward ruining their entire appearance. Selecting a matching color shirt with wide chest and sturdy button stance offers an ethnic finish to the everlasting portly suits. Even sloppy attire can turn handsome, if you complement it with appropriate accessories. Suspenders have been on the fashion runway for several years and still it continues to remain at the forefront. The reason is that apart from being functional, it is fashionable. Adding suspenders to your suit will keep your pants in right place, even you can keep off your blazer as suspenders add edge to your dress shirt and garner a stand-alone look without an outerwear. The Windsor knots of smooth ties in supple colors work great for elevating the style of portly suits. For a relatively flattering profile, finish your ensemble with polished oxfords. Selecting the outfits by keeping your shape and size in mind always help you end up with a handsome look that you're longing for. If you're in confusion where to buy quality suits, just log on to our site Mensitaly.com, where you can find amazing collections that fit your taste and budget.